What is alpha and how it can be generated? In the long run, investor’s profitability consists of two components. The first one is alpha, which basically tells us what are the investor’s abilities to generate revenue, regardless of the favourable market conditions. It can be said that alpha expresses the investor’s skills. The second part is beta, that tells us how big leverage is being used in trading and how risky instruments we trade. As a part of beta, the investor decides how big market risks he accepts. In the Charles Bridge fund, profits are generated exclusively by alpha, while the sensitivity to market movement is kept relatively low. Alpha can be generated by many approaches – in this series I will concentrate primarily on those closest to my trading approach and those which our fund uses on daily basis. Contango is undoubtedly one of the most popular and most used revenue sources. Contango will be discussed in details in the following chapters, but here at least, I will explain the basic concept of why it might be an interesting source of profit. 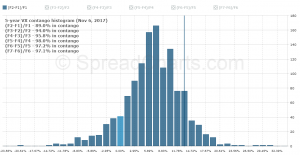 Contango is a situation where the spot price is below the price of futures contracts. Simply said, if you trade commodities, contango is a storage cost. For those of you who trade currencies or bonds, you can imagine it as a positive interest yield. Bellow is term curve for VIX futures, the market is in contango, which is typical for low volatility. If contango is present on a given instrument for a long time, it becomes source of profits by itself – virtually allowing us to make trading profits without price of the underlying asset being changed. 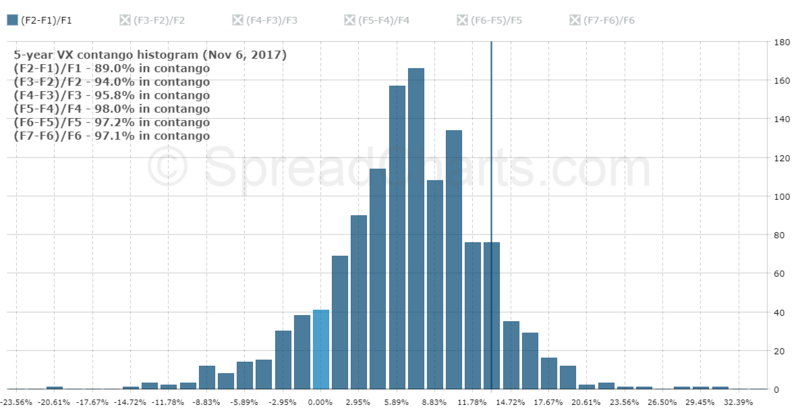 The histogram shows that over past 5 years, the VIX futures market was over 90% of the time in contango. Tracking error is not an official term. We have developed this name in the Charles Bridge fund for the leveraged ETF decay effect based on multiplying daily changes in the price of the underlying asset. For your idea, it’s an effect where, for example, the underlying asset on the first day rises from 100 to 125 and on the second day this asset drops to 100, so the 2x leveraged ETF rises to 150 for the first day, and the next day falls to 90. This difference (between values ​​100 and 90) indicates the tracking error. As can be seen, if the leveraged instrument is shorted, we do not need any change of the underlying asset again to generate 10% alpha in 2 days. Some assets have a fairly reliable distribution of probability in which its values ​​or value scatters ​​will move within. It is even possible to say with what probability they will be traded on such values. It is also possible to determine that the movement of assets A is statistically abnormal to the movement of Assets B. In such cases, it is possible to trade Asset A itself or to deal with Asset A in correlation with Asset B. For example, we can purchase shares or bonds of oil extraction companies and sell the futures contracts for oil. We will receive dividends or coupons for stocks or bonds, while we are earning on contango when shorting oil at the same time. Different classes of assets can be traded based on different fundaments. Commodities are subjected to supply and demand, bond markets should reflect the expected behaviour of central banks, growth and inflation, stock indices reflect behaviour of revenues, risk premiums and discount rates. 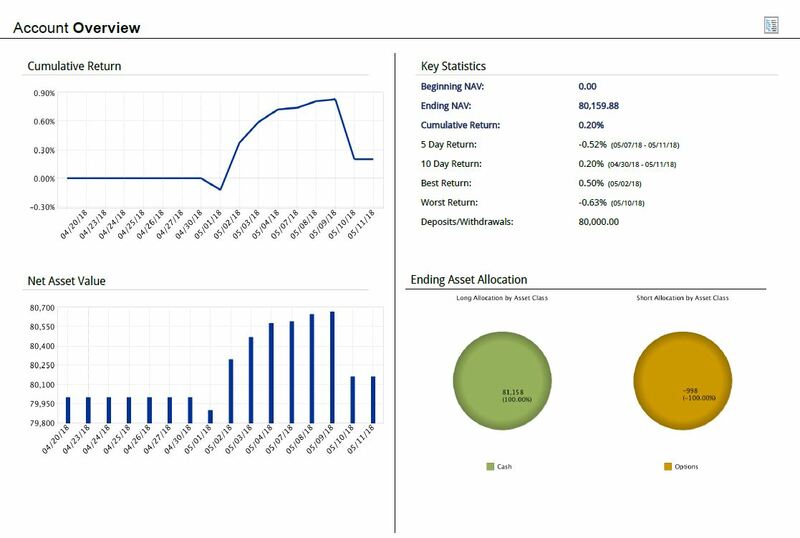 Each asset can be determined by the value band where the asset usually moves. If there is a sudden price fluctuation outside this equilibrium area, an active investor should trade such move with aim to close the position and create an alpha when the price returns to the equilibrium band. Trading around equilibrium band may again bring us certain revenue, without the need for long-term changes in the price of the underlying asset. Alpha can also be generated by option strategies. Whether it is listing or buying options, an appropriately chosen option strategy can make profit even when the underlying asset price stagnates. Typical strategies are covered call strategy, iron condor strategy, selling of the put options, hedging strategies performed by buying stocks and occasionally buying the put options at low volatility. In future chapters, I will show you what option strategy for what instruments we should choose. In one of the chapters, I would also like to mention the impact of transaction fees on the performance of the investor. The more is investor trading, the higher is the impact of the transaction fees. We have succeeded in developing some strategies that deliver liquidity to the market and thus the transaction fees are negative. Within these strategies, therefore, the stock exchange pays us for trading, while we are not paying to the stock exchange or to the broker. Even this is the way how to generate alpha, even though we admit that this area is marginal to us and generating alpha purely and only from transaction fees is a domain of high-frequency trading that we are not dealing with. There are of course other alpha sources, whether it is stock-picking, long/short strategies, and more. As I mentioned at the beginning, I intend to focus on other areas where we have some expertise. However, if you are interested in any specific area, please write to us and if we consider that we have something to say about it, we will include it in our series.